Pretty cheap tools for a good floor fix. While you are below the squeaky floor, have a friend walk around until they find a squeaky area. Have them rock back an forth on the squeaky spot so you can pinpoint the area from below. If you need a little extra help, have your friend knock on the floor. This makes it easier to hear and, if you need to, feel where the squeak is located. 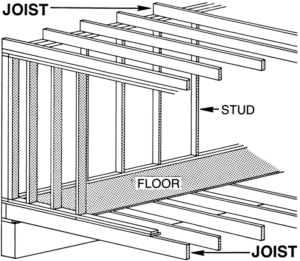 Put a little carpenters glue on the top of the skinny end of a shim and slip it between the floor joist and the sub-flooring where the squeak is occurring. Give it a few taps with your hammer, but don’t push it in too far. Pushing it in too far can raise the floor in other areas and cause more squeaks or other problems. It make take a few shims in an area depending on how much the floor moves. Repeat steps 1 and 2 until you’ve eliminated all the squeaky spot.